She is currently a Primary Six student at Tao Nan School. Being effectively bilingual, she was selected to be in the special BiCEP (Bi-Cultural Chinese Elective Programme) in 2007, and will graduate with the pioneer batch of BiCEP students at the end of2009. Faith is active in school and currently serves as Secretary in the Executive Committee of the Prefectorial Board. She also heads the editorial team of her school newsletter, Tao Nan Scoop. 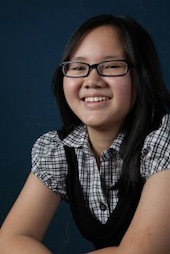 Aside from school, she sings with the Singapore Symphony Children’s Choir (SSCC) and has been selected on many occasions to represent SSCC in various concerts. Since she was 6 years old , she has has served in the Children’s Ministry of her church (Faith Community Baptist Church), , leading in the worship and chorale teams. Faith is currently preparing for her Primary School Leaving Examination (PSLE), and hopes to find time to work on her second book.